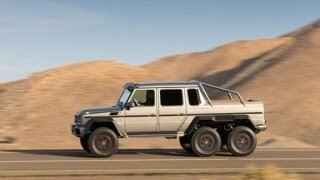 The new Mercedes-Benz G63 AMG 6x6 near-series is an off-roader which represents the last word in forward-thrusting power far from the beaten track. It comes with superior 6x6 all-wheel drive technology, AMG V8 biturbo power and looks that leave no room for any doubt. 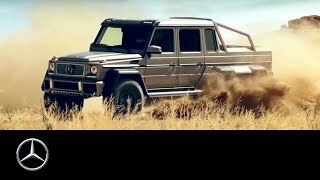 The revised G-Class series-production models lend the superior off-roader the effortless superiority and refinement of a vehicle which has dominated the off-road scene for 34 years.The renowned Mercedes-AMG luxury and performance division contributes the superior engine technology and the interior which is as luxurious as it is comfortable. It is powered by the AMG V8 biturbo engine with 400 kW (544 hp) and 760 newton metres of torque. It has proven its reliability in service with users such as the Australian army. 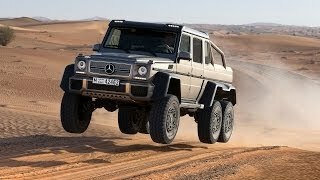 It also benefits from from a 6x6 drive, low-range ratio, five differential locks, portal axles, tyre pressure control system and a special chassis which allows this pickup to make good progress in environments where the concept of individual mobility normally bites the dust as soon as the road ends. Sporty luxury, the hallmark of AMG, is the defining characteristic of the interior. The four electrically adjustable individual seats are heated and ventilated. The rear compartment is equipped with a special centre console while the roof liner and pillars are finished in an Alcantara covering.The rear panel is trimmed in leather.